FolkWorks - IS DYLAN MURAL WORTH A THOUSAND WORDS? 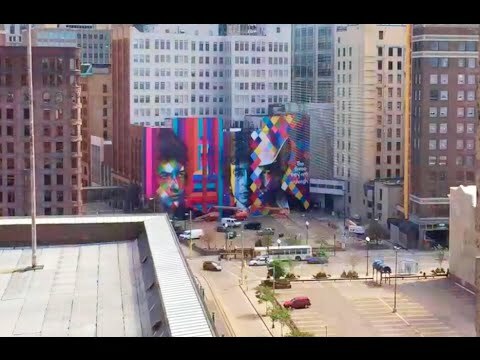 Is Dylan Mural Worth a Thousand Words? Well, Eduardo Kabro picked up on this resonant line and went Dylan one better—here you can almost think that you’re seeing triple, as indeed you are; the mural is a triptych that represents Dylan in three distinct phases, beginning from left to right, the artist manqué from 1963s Freewheelin’ breakthrough album, the Tarantula cover and Don’t Look Back “Dylan Goes Electric” folk rock pioneer of 1965, and the more recent post- Rolling Thunder Review cowboy hat-adorned elder-statesman and future Mt. Rushmore of American Music nominee of Time Out of Mind, Love and Theft and Tempest—all framed by a dazzling display of Picasso-influenced pyrochromatic cubes and one symbolic acoustic-electric guitar in the center. It’s an awesome, massive, inspired evocation of five decades of Dylan’s ever-growing vision of an American landscape that continues to burn brightly in his incandescent imagination—as he does in our collective imagination. Minneapolis was the city where he spent six months at the University of Minnesota, where he remembered “staying up all night plowing through the philosophy of Kant instead of reading “Living With the Birds” for a science course,” before dropping out to become a rambling acolyte of Woody Guthrie heading for Greenwich Village. While there he lived in the campus student section know affectionately as Dinkeytown, where he fell in love with folk music and befriended the editors of The Little Sandy Review—who mistakenly loaned him some invaluable Folkways LPs from their record collection—including the collected works of The New Lost City Ramblers—never to be seen again. At some point Dylan put them all in his backpack and grabbed a fast freight for NYC, winding up in the Holland Tunnel, which he later memorialized in Talking New York—his debut album’s vivid description of “the coldest winter in seventeen years,” February, 1961. But Minneapolis remained vivid in his memory and imagination—as well as “the North Country” he came from—Hibbing, Minnesota; which he captured in both North Country Blues, about the disappearing mineworkers along the iron range of Northern Minnesota where his family lived, and Girl From the North Country, his classic love song for the girl he left behind—which he would eventually record with Johnny Cash. It is essential to an understanding of his growth as an artist that Dylan came from Middle America, not the big cities but what Greil Marcus described as “The Old, Weird America,” the last living link to our small town and rural prairie past. 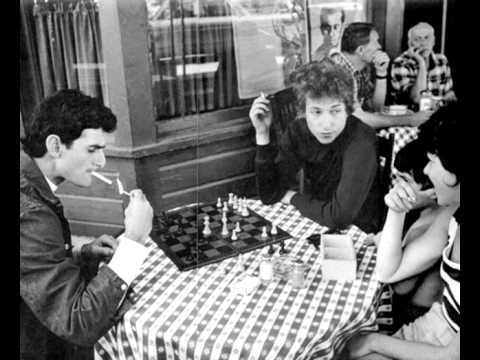 As Dylan would write later they “didn’t have a TV;” he listened to the radio to discover the wider world—which was the beginning of his musical education. He credits that to his continuing emphasis on aural and oral imagery—not just visual: “The harmonicas play the skeleton keys in the rain,” and “the ghost of ‘lectricity howls in the bones of her face” from Johanna. To see the enormous hoists from which the artists had to work on the upper floors of Kabro’s mural is to be put in mind of Michelangelo’s arduous perch beneath the Sistine Chapel’s extensive ceiling; it was an extraordinary physical challenge beyond any feats of imaginative daring—more like building a bridge than painting a mural—as indeed it was—in poet Hart Crane’s sense of the Brooklyn Bridge as a metaphor beyond its physical means of conveyance from Brooklyn to Manhattan. This miraculous bridge takes you from Dylan’s early folk period to folk rock to his current amalgam of blues and standards from Frank Sinatra’s 1950s canon all the way back to the “ancient footprints” of his new song Early Roman Kings on his most recent album. Dylan’s music holds the whole world in his hands, and Kabro’s mural evokes his sublime vision of America’s past that embraces its links to ancient civilization as well. That it took a Brazilian artist to fulfill the potential of Dylan’s artistic vision for a mural is in itself a testimony to the worldwide scope of his music. Bravo, Eduardo Kabro! Dylan is on the mind of many writers and artists this year—the 50th anniversary of when he plugged in and went electric at the 1965 Newport Folk Festival. Elijah Wald has just published a book about that magic moment called Dylan Goes Electric.